Trade to your full potential. We create and deliver platforms that make trading cotton safer and more efficient while accessing more of the cotton market, both in the U.S. and China. Transact with confidence. We provide robust settlement and business process support through each cotton trade. Reduce costs. We automate processes to minimize the effort required to handle physical commodities, including cotton and peanuts. We've developed technologies that help cotton growers and buyers find the best cotton prices today. The Seam has helped hundreds of companies thrive in today's challenging business environment. We have accomplished this by providing internet accessible services that produce results without requiring expensive software. Our clients will tell you—our innovative market solutions and responsive customer service make it easier for you to generate improved returns and lower your costs. "The Seam is a great tool for cotton traders providing real-time market information and a platform where reputable buyers and sellers can trade. It is the first thing I check every morning and then again periodically throughout the day." "The Seam is very helpful in letting others know what we have available to market. Staff is very easy to work with and quick and guaranteed payment to boot!" "Buyers that I didn't even know existed are looking at and bidding on recaps that I post on The Seam. And to make it even better, The Seam guarantees the transaction. I tell my growers it's like eBay for cotton. I put it out there and every buyer in the country can look at it." "The Seam is a very important marketing tool for our company. Easy, simple, secure. The staff is great too!" "The Seam provides opportunities to cotton buyers and sellers that wouldn't be available otherwise. The Seam, and its team, are an asset to any modern day US cotton company." "Access to markets with the security of the financial backing of The Seam allows us to trade with customers to get the best prices available." 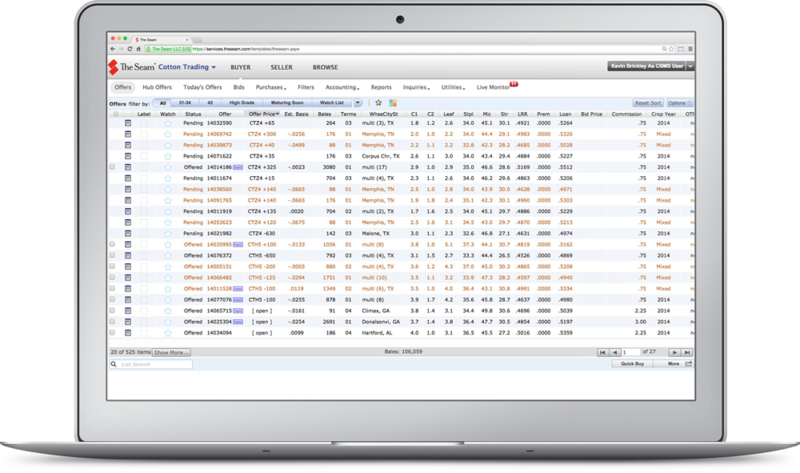 The Seam's Cotton Trading system gives buyers and sellers a comprehensive view of the market. Find real-time cotton prices today. Time is money. And so is accuracy. The Seam's exclusive online Basis Estimator values every bale of cotton in the system in real time. No calculator needed. Our Live Monitor reports real trades as they happen. Eliminate the guesswork and get the true value of the market. We have the industry's only comprehensive warehouse database. Our built-in FOB Cost Estimator easily computes the total costs for each offer. Each sale is marked to the futures market for the ultimate in market insight. Basis level and local trading terms are automatically yours. Our fully searchable system ensures you're constantly in touch with the cotton trade.